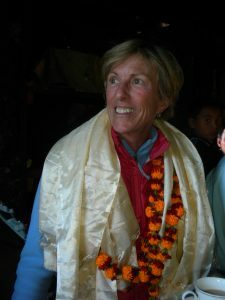 The friends and family of Clare Rhoades have decided to honor her vibrant life through partnering with the dZi Foundation to bring much needed health, education, and income generation support to 2,363 people in Khatamma, one of Nepal’s most isolated villages. Clare Rhoades was an adventurer, artist, caregiver, athlete, and friend. She was a talented artist, a skilled weaver and a ceramicist. She loved theater, opera, music and dancing, and she was a superb and creative cook and entertainer. Clare was perhaps best known among her friends as an avid adventurer – hiking, backpacking and running rivers all over the Southwest. She ran the Colorado River through the Grand Canyon in a 12-foot inflatable kayak, much of it by herself. She trekked extensively in Nepal, Bhutan and Tibet, and was happiest when high above tree line. She also spent several weeks one year working in the Kathmandu clinic of Dr. Buddha Basnyat, a Nepali specialist in high-altitude illness. Clare was deeply touched by the people she met in Nepal during her many adventures there. Our goal is to raise $100,000 per year for the next three years to meet the goals Khatamma. Richard Hughes will be matching up to $50,000 each year. Please join us in helping us reach our goal. To learn more about the Clare Rhoades Memorial Fund and how your support will transform the lives of thousands of people in Nepal, click here.